Despite concerns that exposure to crumb rubber may be dangerous to young athletes’ health, Loudoun County is sticking to the material, for now. 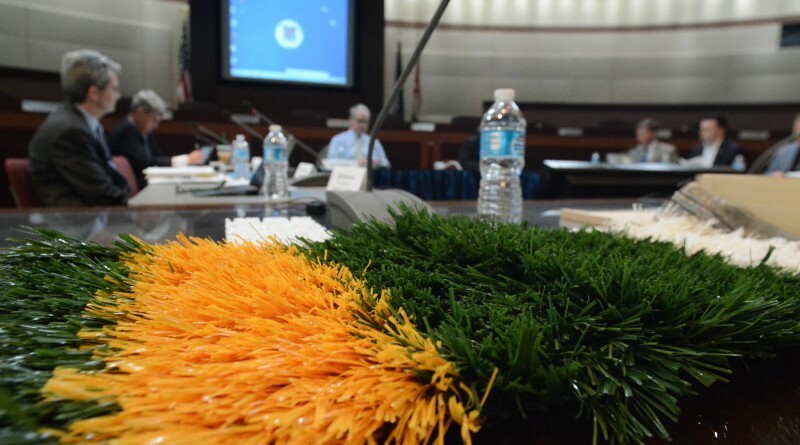 Eleven of the county’s public high schools are outfitted with crumb rubber fields, the cheapest type of artificial turf, and the remaining four high schools are in line to receive synthetic turf fields by 2023. “We are moving forward with using the crumb rubber,” Kevin Lewis, assistant superintendent of Support Services, announced Friday. He and Loudoun County Health Department Director Dr. David Goodfriend presented a report to the Joint Board of Supervisors/School Board Committee on Friday. Lewis detailed the costs and benefits of crumb rubber compared to other artificial turf options, and Goodfriend addressed a worry that athletes who play on the fields can ingest dangerous carcinogens. “Is there a health risk from crumb rubber? It appears unlikely based on the research we’ve done,” Goodfriend concluded. He said there is not a spike in cancer among young people in Northern Virginia or other regions that have a lot of crumb rubber fields. But, he noted, that it may take years for cases of cancer to occur, so he plans to keep tabs on national and state-level studies. Tony R. Buffington (R-Blue Ridge) said he has serious concerns about Loudoun children playing for hours at a time on the material derived from recycled tires. He’s hesitated to advocate Briar Woods High School receiving an artificial turf field, without the school system opening up options for an alterative material. 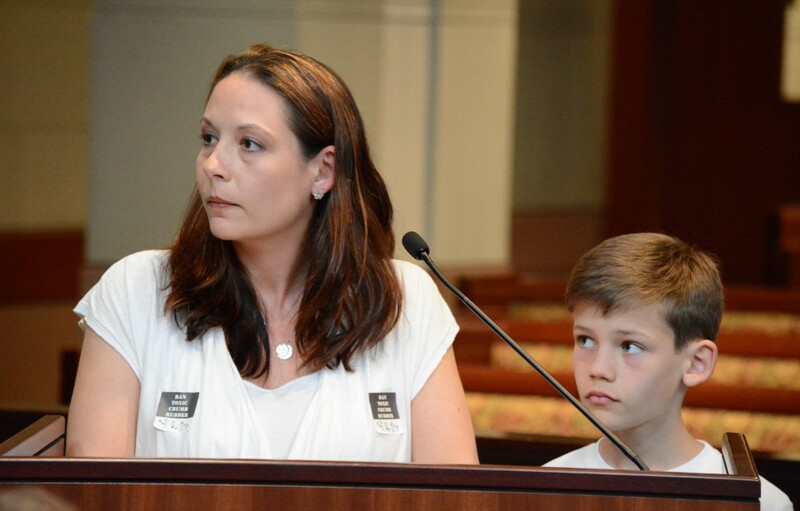 Stephanie Heese, a Loudoun parent, addressed members of the joint committee alongside her young son, Nicholas. She requested an emergency moratorium on crumb rubber and for the county to post signs near the fields warning users about potential dangers of exposure to the material, which she said contains 96 different chemicals and 12 known carcinogens. Lewis’ report illustrated that using crumb rubber over other field infill options saves the school system more than $210,000 per field. Over a 24-year period, a field with crumb rubber infill cost about $2.34 million. Prices for other alternative infills are: acrylic coated sand called Envirofill ($2.56 million), thermoplastic elastomer pellets called EcoGreen ($2.79 million), PureFill or cork ($2.95 million) and organic infill ($3.03 million). Natural turf grass costs about $2.27 million over that same period, but does not provide as much play time as the artificial turf options. Each material has its challenges, Lewis said. For example, fields with organic infill produce a lot of weeds. “There’s all kinds of things we need to consider,” he added. The two boards are expected to continue discussing the issue as new studies on crumb rubber and other field alternatives are published. Goodfriend is scheduled to speak to the Board of Supervisors on the topic later this month. However, it doesn’t appear any deviation from crumb rubber will be made in time for Potomac Falls High School’s new field. That bidding process for that project, estimated at $1.2 million, begins this week. The School Board’s current Capital Improvement Program calls for synthetic turf fields to be installed at Briar Woods in 2022-23, and Dominion, Freedom, and Heritage in 2023-24.